The PVi 10 is a two-way speaker system featuring a 10" woofer and a high frequency drive on an exponential horn. The lightweight-yet-rugged, carpet covered trapezoidal enclosure with top handle is ideal for live music, speech and music playback applications. A full length, black powder-coated steel grille provides driver protection and a professional appearance. 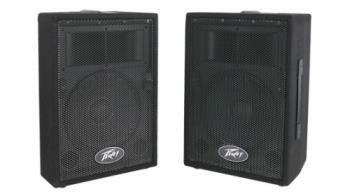 The PVi 10 speaker system is rated at 50 watts program power handling. Its smooth response makes this system ideal for smaller venues where space is at a premium, and its two 1/4" input connectors keep amplifier hookup simple.